Has anyone else been watching The Unbreakable Kimmy Schmidt? I think it's absolutely hilarious. Like laughing out loud alone in my apartment my hilarious. I love comedy but there aren't many things that make me laugh out loud when I'm alone. Pretty much just my dog and The Relevant Podcast. Lately, my routine has been coming home from work, doing a workout, and then watching Netflix while eating dinner (and ignoring how disorganized my apartment is. I made this dinner last week when I wanted something quick (so I could watch the Peeno Noir episode). I had some leftover chicken so I baked some bacon and this came together in about 5 min. Enjoy. 1. Heat up a skillet on medium heat. Spread butter on one side of the tortilla. 2. 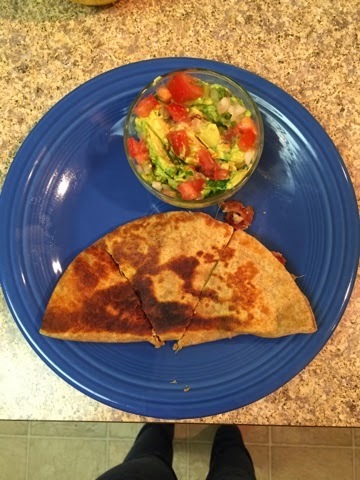 Place tortilla on the heated skillet. On one half, put the chicken slices and crumble bacon. Sprinkle with cheese and fold other side of tortilla on it. 3. Once the tortilla half has turned golden brown, carefully flip. Cook until cheese has melted and other side has turned golden brown. Serve with avocado and pico de gallo.